Most people think of chicken soup to help soothe what ails you, whether it be a cold, or just plain feeling in the dumps. I have a go-to soup that I grew up eating that reminds me of home and our warm kitchen sheltered from those frosty, Midwest winters in Milwaukee. My mom, forced to be resourceful to keep a family of nine fed, would make a huge pot of this on the weekend. Being the youngest, it was one of my favorite meals because I was always guaranteed my own bowl and I never got gypped any of the vegetables. This past winter, I made this soup several times as it’s quick, budget-friendly, and I can always find all of the ingredients. There’s something wonderful at work when a simple broth and a few vegetables can make all your cares disappear for a moment. A good soup can provide nourishment and solace with every steamy spoonful. I keep telling people it really doesn’t rain all that much in Seattle as our reputation suggests. But when it does, it too, is welcoming and a soup like this is a good companion to help you weather out the storm. I hope you’ll try this recipe the next time you’re looking for a light, but hearty pick-me-up that you can warm up with and share with your loved ones. 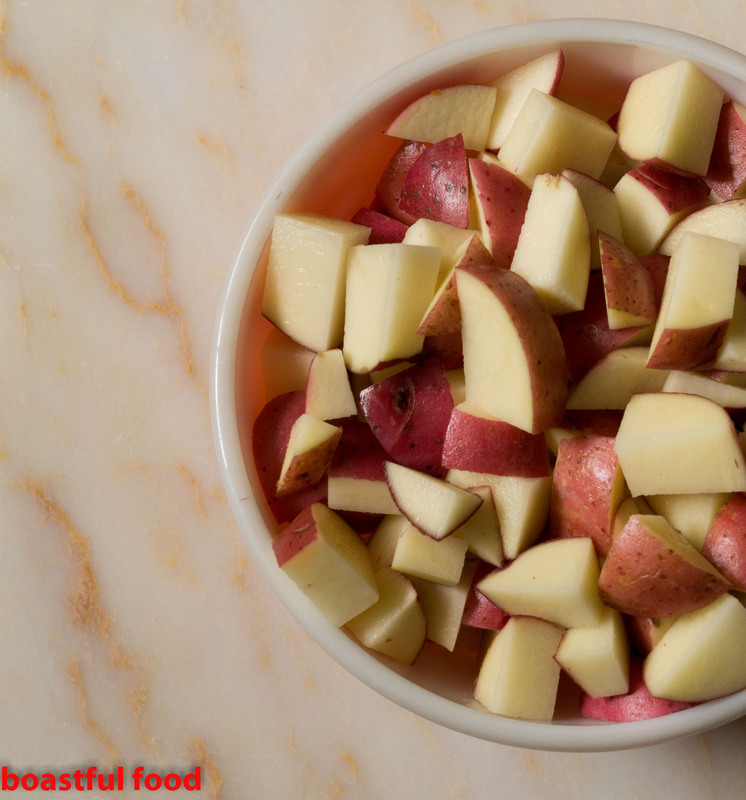 This recipe is very simple and cooks quickly so it’s best to have everything chopped to add to the pot all together. In a large stockpot, over medium heat, warm olive oil and then add diced onions. Cook until soft, about 2 minutes. Add garlic and cook for about 40 seconds or until it is soft and begins to release its aroma. Add vegetable juice, vegetable stock and cold water. Next, add in carrots, potatoes, corn and cabbage. Season with salt and let simmer for about 40 minutes or until the carrots and potatoes can easily be pierced through with a small paring knife or fork. 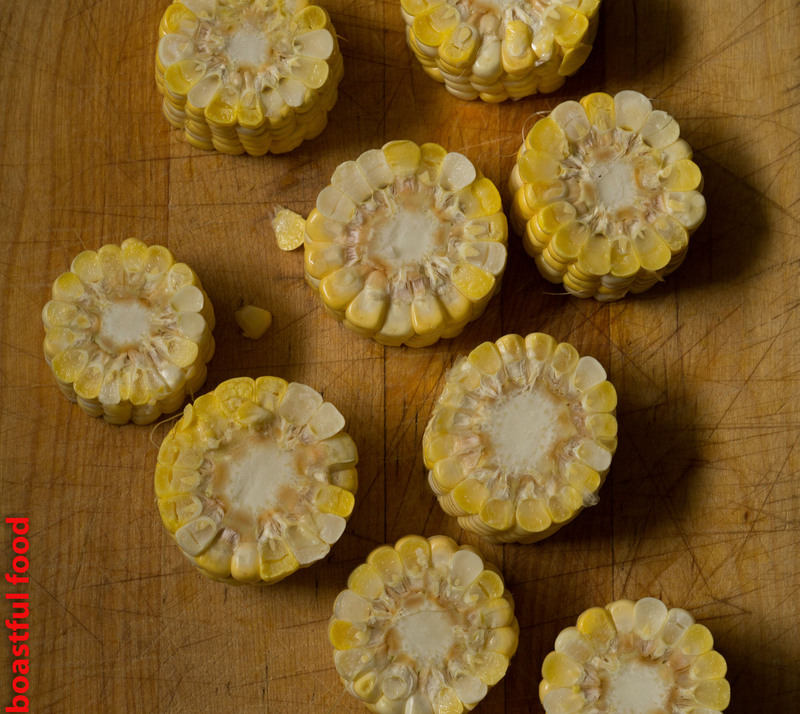 A tip on cutting the corn for this recipe. It will require a sharp knife and very careful cutting as corn cob is tough to cut through. I like to use a knife with a wide blade and press firmly but slowly down until you cut through. Fresh corn, which is just now showing up in most supermarkets, is a nice addition to this recipe as it has a sweetness and straw like flavor that adds earthiness to this soup. I usually eat this last as it absorbs all the flavors of the tomato broth and other vegetables. Frozen or canned corn work just as well, too. Tags: all vegetarian vegetable soup, rustic soup, vegetable soup. Bookmark the permalink. Your rustic vegetable soup simply worked out great, I try adding lemon syrup with little ginger garlic paste and it just made my taste. Thanks for sharing Raquel. That’s great,Seema! I love the additions you tried. Sounds tasty!